The MicroBiological MB ActiveCleaner is the perfect accompaniment to URIMAT waterless urinals. It not only prevents 'bad bacteria' from developing, but it also contains special biological ingredients, which gently treat the bowl's surface. 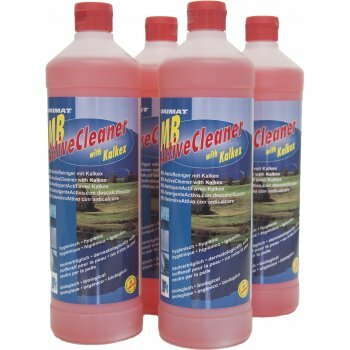 MB ActiveCleaner offers excellent cleaning power and removes any bad odours that may occur as a result of the decomposition of organic substances. It removes lime and soap residues and delays renewed soiling. It is particularly suitable for maintenance, cleaning and odour removal in heavily used sanitary facilities. MB ActiveCleaner is supplied as a concentrate which is diluted 1:20 with water before use which makes it very economical. At 1:20, this item produces 80 litres of cleaner which makes it very economical to use. Countless other possible applications. Try for yourself!